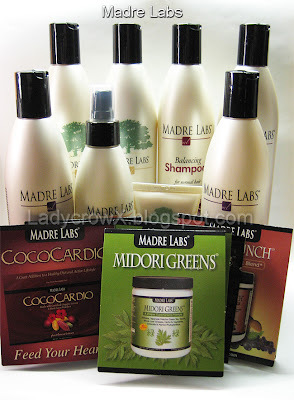 A while back I won a giveaway that Phyrra had been hosting, the giveaway included a bunch of Madre Labs products. I had never heard of them before until I read about them on Phyrra's blog and was definitely interested in checking them out. My hair is dry, thick, and can be frizzy as well so anything to help my hair is a blessing. The giveaway prizes also included a few samples as well. I have been using the moisturizing shampoo and condition as well as the leave in conditioner so I will have a review up shortly about them. One thing I can say for sure is these products smell divine!